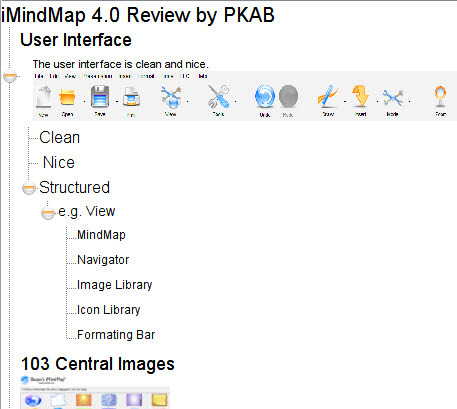 iMindMap 4.0 Review | . :: Peta Konsep Anak Bangsa ::. There are 103 central images you can use to start your mind map or using your own image. My first impression is the user interface is clean, nice looking icon and structured, e.g. the View Menu divided into view as mind map, navigator (when your mind is large you need overview), image library, icon library (for coding your branches) and formatting bar (change branch color, font type-size, alignment, etc). I like how the iMindmap draws branch (it will more natural when you are using pen/ tablet pc), just click and drag the red circle from the beginning point into the end point of a branch. The branch has organic feel and curvy branches. The program can help you to arrange branhces in nice spacing using auto layout (menu –> Tools –> Auto Layout). Here, you could set from Linear, Organic (default) up to Radial for the overall mind map. The branch label can be formated as: Align to start of branch, Align to center of branch, Align to end of branch, Spaced label, and Streched label. You can see those label format at the childs of “e.g. View” branches. There are capabilities to add a new branch at: before (the current branch), new (child), after (grand child of the current branch). You can draw sketches and place it at a branch. The Draw capabilities are: Organic (default), FreeHand (very fun experience), Arrow (connection between branches), and Boxed branch. 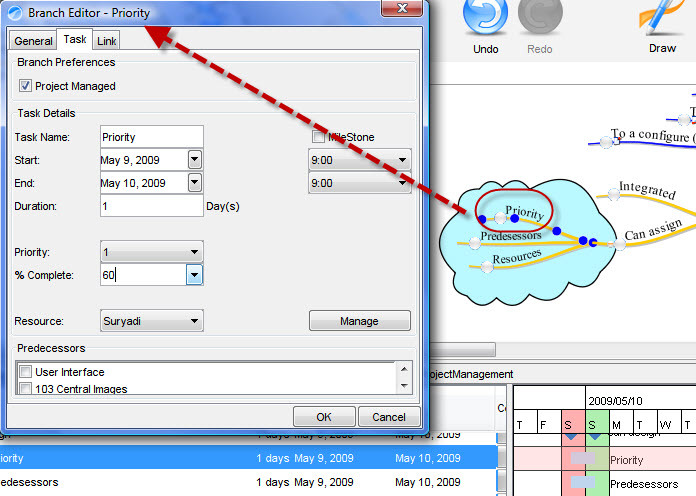 There is also Project Management Mode integrated in the iMindMap where you can set: Start – End Date, Duration, Priority, % Complete, Resource, Predecessors, put Link (to files or a web site address). At a branch you can add link to: a file (any file from you local computer), to a web address, to another mind map, configure (here you can put many files and a web address together). I also like the audio notes where I can record, hear, delete a naration at a branch, so the reader now can also listen to my explanation. In the text editor you can format text using font face-size-color-effect, subscript and superscript, put table, image, adjust indentation, alignment, bullet, number, etc. I can not test The E-Learning Cource (ELC) Builder because I still in evaluation mode. Where you can install an *.elp file that produced by others and start to learn the material. I feel the E-Learning Builder is very promising to help children learn their difficult school subjects in Mind Map format easily. Where they can repeat the audio notes as many times they like, absorb the key words and key images, read details in the note. There is a image search in the Image Library where you can search images in 3D, animated, clip arts, photo objects. While the search in on going, you can continue work your mind map. To put an image, you just click the branch, then click the image, after that click Insert button, finally you resize or move the image as you like. There is Presentation Mode where you can deliver your speech in nice and the mind map unfold one branch at a time or whole main branch at once. You also can adjust the speed of appearing branch (slow or fast). 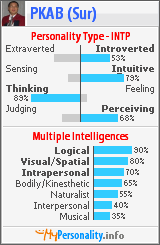 Since I have been used mind map technique, I am not comfortable with Text Mode. However the Text Mode is for newbie in Mind map. I can create a child mind map (or multi map) by using “Create a child mind map” command, but I still don’t know to combine them together again. At the end of my evaluation I have 6 suggestions and 2 question at my last dark green branch of the mind map. 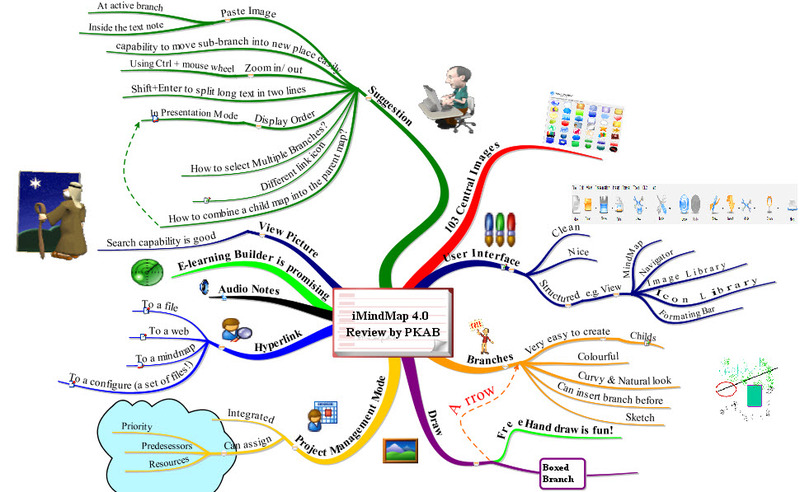 Overall, I satisfy using iMindMap 4.0 and try to use more often in order to master it. This is a good review, well done. However it is so important to make sure that you follow the seven rules of mindmapping to enable your brain to make effective use of the information.